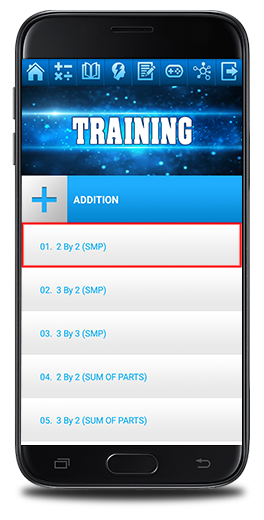 The TRAINING programs follow the LEARNING section in terms of the same math subjects and techniques with a few exceptions in which the LEARNING contains but not the TRAINING. 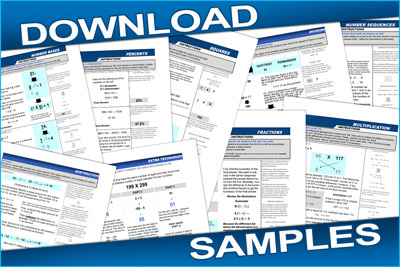 Here, some parts of a technique are automatically generated while you will need to fill in the answers for other parts identified by the program. You are also recommended to complete the LEARNING section before attempting the programs in this section. An ADDITION technique is selected from the TRAINING section. It is for adding two digit numbers to each other. Basically, simplifying one of the two numbers is part of the strategy. 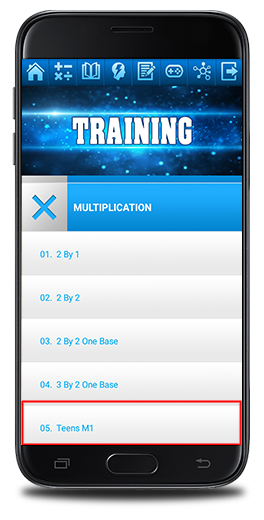 A MULTIPLICATION technique is selected from the TRAINING section. This is one of two techniques for multiplying numbers in the teens (11-19) together. A PERCENTS technique is selected from the TRAINING section. 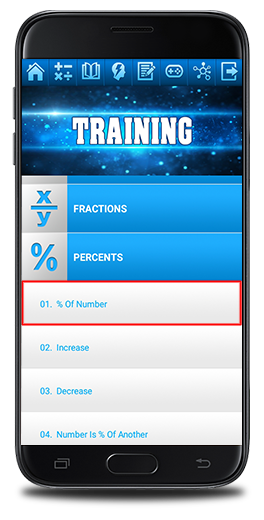 This technique is straight forward and is for finding an amount of a number or value dependent on a certain percentage. 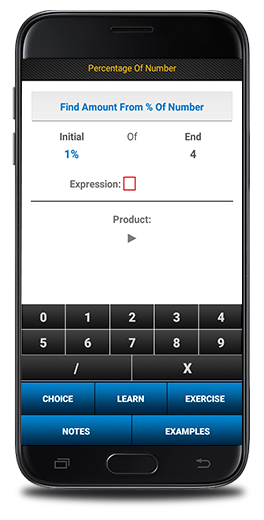 Press the EXAMPLES button to start the lesson which is automatically self driven. Some parts require you to enter the answers. Read the instructions or information by pressing the NOTES button before starting the program. 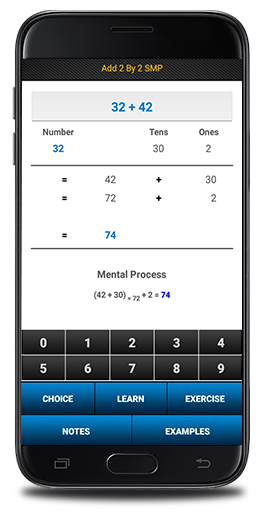 Two methods are in this app for multiplying numbers in the teens (11-19) to each other. 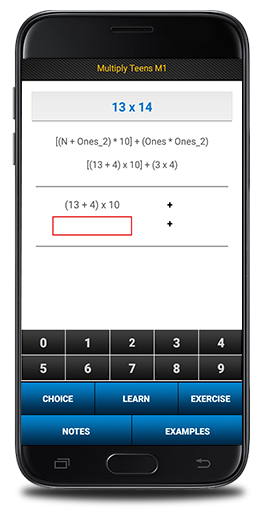 This technique involves adding one number to the ones digit of the other number, multiplying the sum by 10, and then adding the result to the product of the ones digits. The part that requires an input by you is specified by a box outlined in red. Learning how to enter the correct answer with proper syntax in certain situations for a specified part is very important . So completing the programs in the LEARNING section ahead of time is crucial.